You have no clue how good you have it. The simple, everyday things that you get to do that the 7-years-later-in-life you would probably cut off her right arm for. Let me count the ways. 1. Remember when the other day when you woke up at 10am? Let me tell you what Saturday mornings are like now. It usually starts with an early morning wakeup call from your baby crying “I’m huuuuuuungry” – so you go in and nurse him. Did I mention he has teeth and bites now? 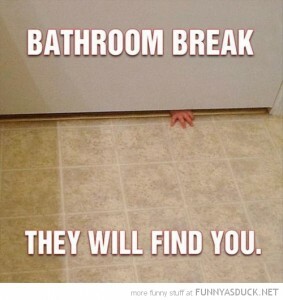 You’ll sludge back to bed and sleep for another couple of hours only to be awoken by your toddler whining at her door. You’ll try to coerce her into falling to sleep in your bed for a few more minutes. She’ll lay there only to continuously say, “Mama, I want Gabba-gabba.” Trust me, you’ll fold like a deck of cards. 2. Going out the night before with your girlfriends. The 25-year-old you could just call your friends on a whim and meet up at the bars. Now, it takes a full moon and a wish to have a ladies night out. It’s summarized in one word: planning (something that it never took before). Plan for your husband to take care of the kids, warm up bottles, feed the baby while entertaining the toddler, bath time and bed times for both. Ladies night may just have to start until the kids’ after bed time. By then, you’re half asleep anyways. 3. You just peed with the door closed. The 25-year-old-you has so much privacy it’s ridiculous. 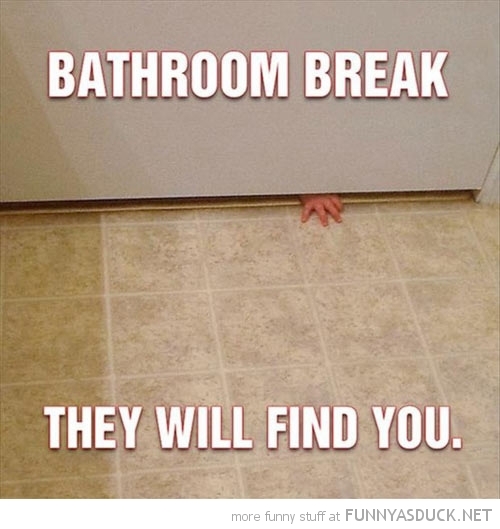 What happens behind the bathroom door stays there. Now, not only are you doing it with the door open, your two-year old is screaming through the house, “Mommy went pee-pee!” Added benefit though, you may get a sticker from your potty-training daughter. Take that 25-year-old-you. 4. Sitting down and eating a meal in its entirety. Whether at home or going out the 25-year-old Jen could sit and enjoy an entire meal (appetizer through dessert) without standing, inhaling, having to get up, cleaning up a spilled drink, etc. There are times when meals aren’t eaten until 9pm or at all. Lucky you. So 25-year-old Jen, I don’t want to hear your complaining. You just enjoy your ladies night out eating a good meal and drinking good wine followed by sleeping in. I’ll just be peeing with the door open, quite possibly sneaking a snack in. Don’t judge. Smarties – what would you tell the 25-year-old you? What would Claire Huxtable do? The Big V – Vasectomy!